Jacuzzi baths always start out great, but because they work by pumping water in jets through the tub, they can be noisy. If not cleaned or used regularly they can develop mold issues that are a hassle to remedy. One company, Toto decided to replace the traditional water jets with air jets, which not only are more relaxing, but reduce the noise factor and the necessity of special cleaning. Toto airbaths can create a truly relaxing spa experience, with some unique details. 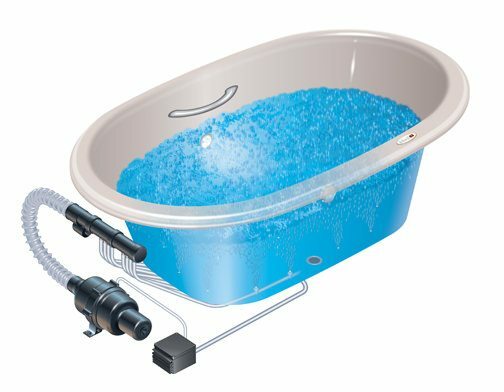 The air tub can be fitted with LED lights available in eight colors. The spring-loaded, anti-return valve keeps soap, bath oils and bathwater from backing into the air pump system. The result is a fresh clean massage bath every time. The air blower technology allows for quiet operation and gently heated air provides a soothing experience. The Toto airbaths sport some great looks, with matching bath fixtures in several styles, including sinks, commodes, and pedestal wash basins. The airbaths are available in two colors, white and ecru with three trim finishes: copper, gold, or silver for the solid brass grip bar, handles, faucet and stopper.